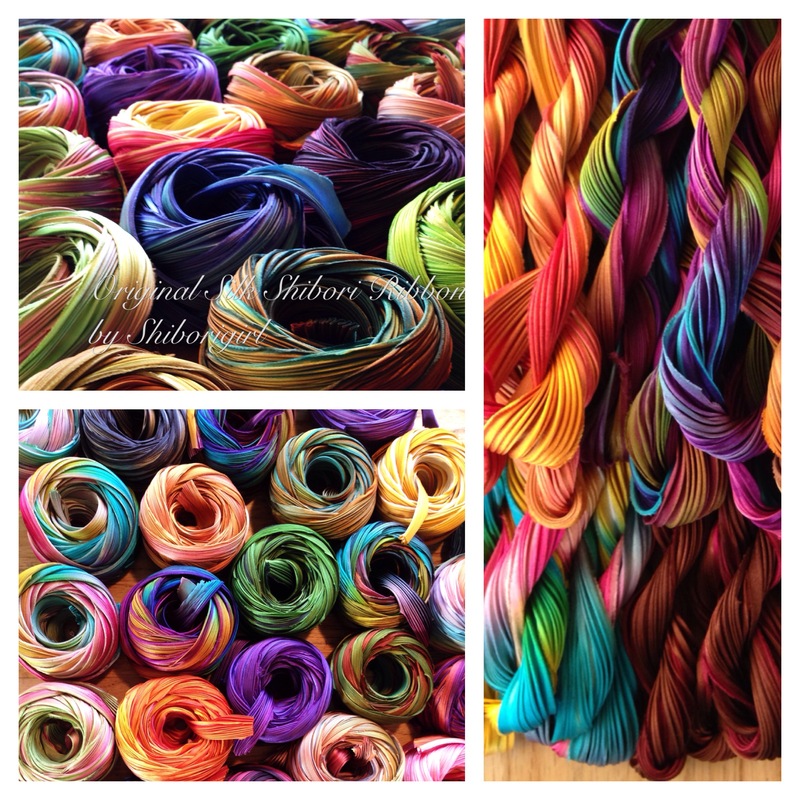 On this hot and muggy Sunday I finish up a large order of the shibori ribbon and wonder. Often when I wonder about what I am doing I take to the vat and gain some perspective. Besides, I have a couple of workshops ahead of me here-3 that involve indigo and need some wondering and planning time. Starting off with some moons on old tattered asa (hemp) from Japan got me thinking about what ties us all together on this little planet we named Earth – as well as what tears us apart. I figure I need to order 30 yards of cotton scrim for my workshop in Houston October 26- done and crossed off the list. The rest of the fabrics to be used are remnants and scraps I have been collecting of some very lovely old and reused fabrics brought back from Japan. We will dye them in indigo and apply different techniques- shibori mostly, as well as use our imagination before stitching them to the indigo dyed scrim. Kits will also include swatches of vintage kasuri, katazome, and shibori. I will have several very nice vintage boro textiles on display for students to study as well as a selection of books and photos from my recent visit to the Amuse Boro Museum in Asakusa, Japan. Pressing on, I make my sample by my own hand, I cut the fabrics, collect the swatches. As I dye the new sample I think about the room that I will be teaching in, the number of students, the problems that will be encountered by restrictions of such a setting and must be solved before anyone walks through the door to make things go smoothly and find success for all who gather that day in that room. I aim for a version of perfection knowing full well that there will be less than that achieved but aiming high is where I like to begin. I am already looking forward to teaching this class and its myriad lessons. My class is called Indigo dyed and Boro Stitched and can be signed up for by going to the Quilts Inc. site for the Houston International Quilt Festival. The class is # 117 on Monday Oct. 26, 2015 in the online catalog. I am teaching two other classes there as well- Shibori Mandala Magic on Silk (class #217) and Splendid Silk Shibori Poinsettias (class # 611). The Mandala class is an outcome of working with Richard Carbin and combines the folding techniques I learned from him with a completely different method of resisting and applying the dyes. Richard’s presence will be felt in the vintage silk fabrics we will use which were collected by and purchased from him. 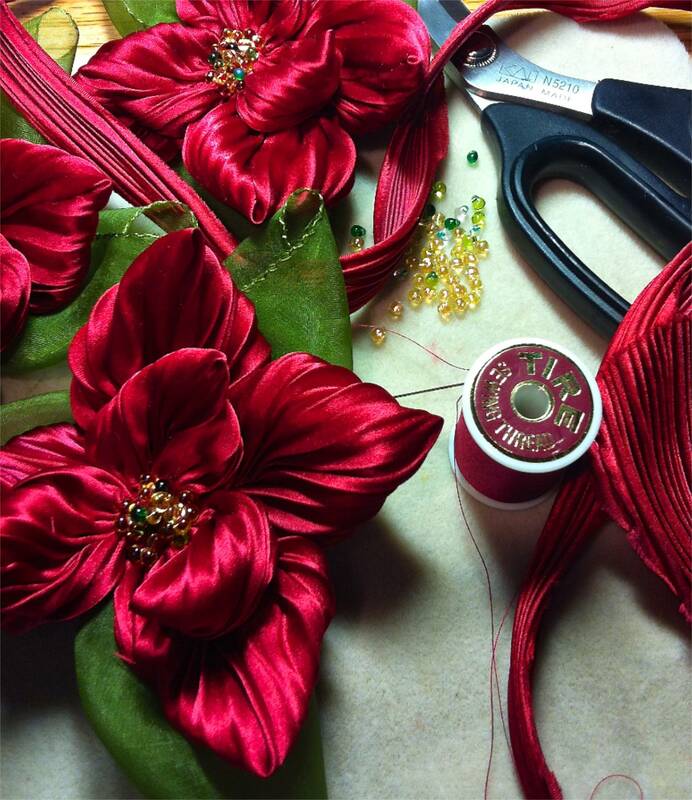 The Silk Shibori Poinsettia class is a fun Friday evening class- a good sit down and relax class at the end of a busy week. Many lovely pieces are sure to be made as gifts for friends and family on this night. I tried to upload an image of a great little boro piece I brought back from Japan but WP is being fussy right now so it will have to wait until later. Until then, I’ll add a couple of photos of something I made the other day just to satisfy a need I had-a small bag that snaps open by pinching the sides and holds all I need. I used some obishin between the cloth layers. This entry was posted in boro, dyeing, indigo, japanese textiles, mandala, mending, moon, shibori, shibori ribbon, silk experience, silk shibori ribbon, silk shibori ribbon flowers, teaching, wondering, workshop and tagged indigo, mandala, mending, quilt festival, shibori, shibori ribbon, shiborigirl, silk, silk shibori ribbon, workshops on July 20, 2015 by shiborigirl. What a wonderful group we had this weekend at the museum. Many continuing and new students all gathering to learn and practice more indigo and shibori. Everyone left wondering what would be next. 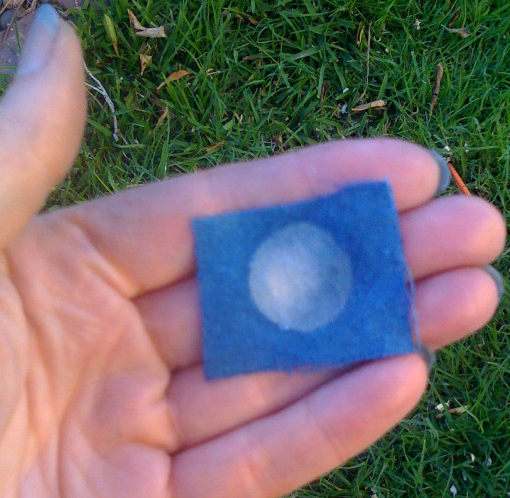 This entry was posted in about shibori, boro, dyeing, experimenting, indigo, moon, workshop and tagged janm shibori on February 4, 2014 by shiborigirl. a late night obsession. maybe I’m not quite back on PST yet. later this week there will be a shop update. of various sorts. 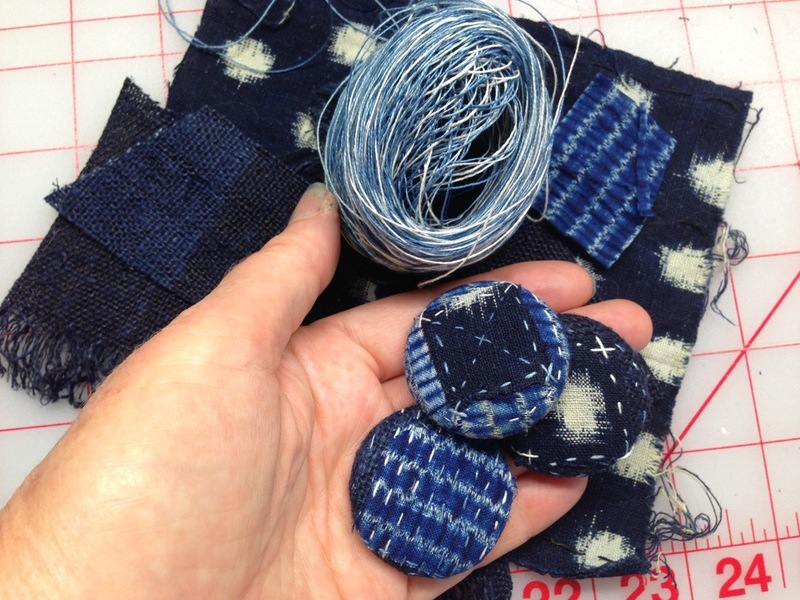 This entry was posted in boro, indigo, inspiration, japanese textiles and tagged boro, buttons, indigo, textiles on June 16, 2013 by shiborigirl. White. Is it a color? If black is the absence of color (darkness) then is white (light) the combination of all colors in the visible spectrum? As a dyer, this is interesting to me. White is often my canvas when dyeing and dyeing something black takes a whole lot of colors mixed together. Strange. Many of you who have taken indigo classes from me recently have received materials kits containing a whole variety of great old fabrics-all natural and of course dyeable in indigo. It’s informative to look at the structure of old fabrics. 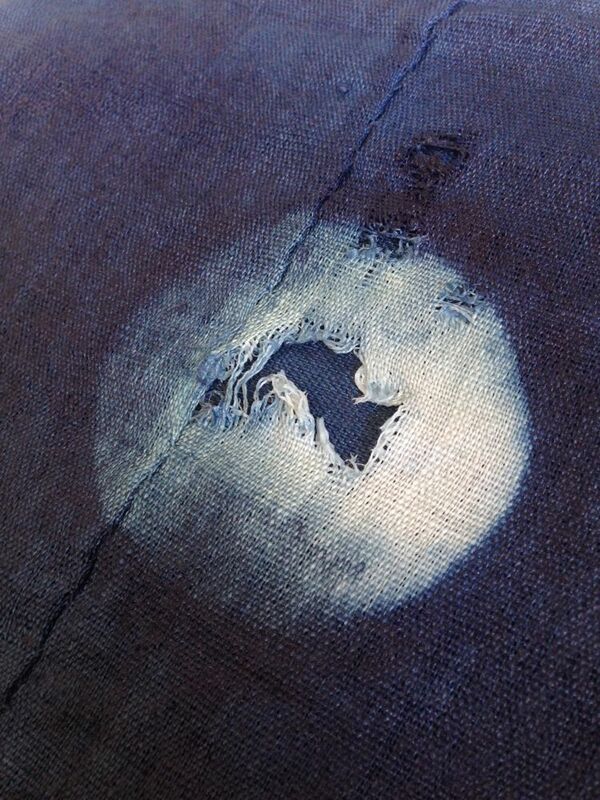 This cloth that was formally the fabric of people’s lives. Literally- laces, tablecloths, clothing, bed coverings, kitchen towels, even mosquito netting and more. 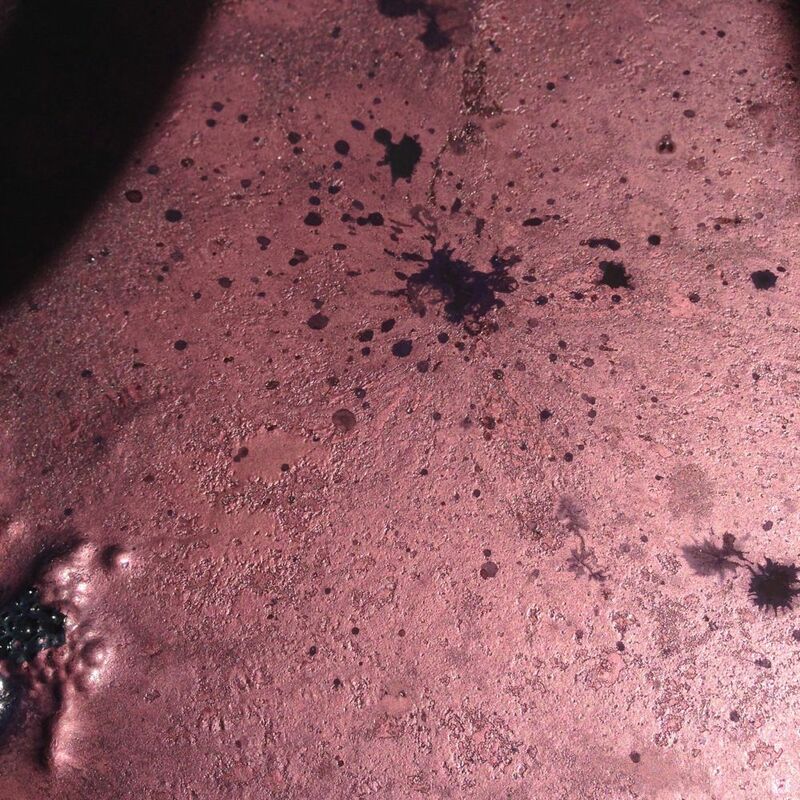 Each type of cloth reveals more about itself when dyed in the vat-it’s thickness, weave, age, and even stains that dye differently from the whole cloth. Next to each other, they can form an amazing array of beautiful blues or whites. But what if they were left as they are? Left to use in other ways, to stitch together new dreams and aspirations? That is what I see going on in Jude’s new class What If Diaries. Definitely not a craftsy class where everything is laid out for you to make or do according to the plan, but a way to explore much deeper. The class is now sold out but she has others of a similar nature to explore. I like that the cloth is explored more deeply- that students not only connect themselves to the fabrics, the stitches, but that there is always a stream of consciousness floating in the background as a jumping off point to some new or even old idea. It’s kind of like what I imagine the beginning of the universe to be- sort of like a primordial soup of creation. And speaking of creation- last weekend at the JANM (Japanese American National Museum) we had a really grand time. I took a whole silk display and we even reeled silk on the old zakuri. The students were in awe as most had never seen this before. The ingeniousness of the device AND that of the silkworm and it’s cocoon. I don’t think they’ll ever take silk for granted again! And of course we dyed silk- new and old. Itajime was the focus and this was a quick pic of their first pieces of the day. After this, I got too busy to take photos-as usual. Many left class and went straight out to the front desk to sign up for the Aug 31-Sept 1 class. In this 2-day workshop we will focus our intentions on practicing itajime (fold and clamp) shibori on recycled kimono lining silks. Once considered as precious as gold, old silks are being discarded at an alarming rate! Let’s breathe new life into them and improve our understanding of both silk and itajime shibori. Indigo and colorhue dyes will be used in this workshop. Both days: $70 members; $90 non-members, an additional $45 materials fee (cash only) will be collected at the beginning of class, admission is included. RSVP early, 20 students max. So, if you are in the mood for some cloth that really moves you-cloth containing texture as a main component, fragments like scattered thoughts across time and place, imperfection seen as perfection, then click on over to the shop and see what’s old. And if you think you want to join the JANM workshop in Aug. you might want to sign up early. 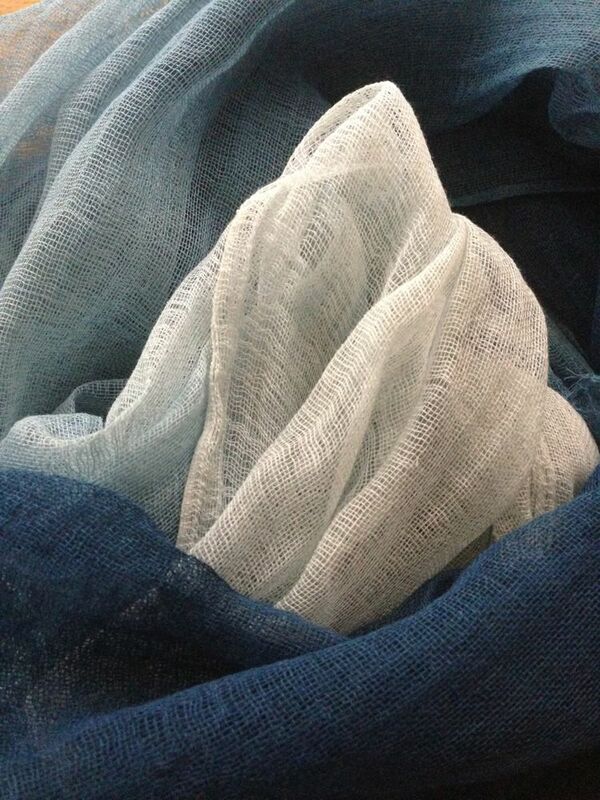 This entry was posted in boro, inspiration, shibori, silk, slow cloth, textile therapy and tagged cloth, cotton, handwork, indigo, linen, silk, spiritcloth, vintage, what iffing, white, wondering on April 11, 2013 by shiborigirl.